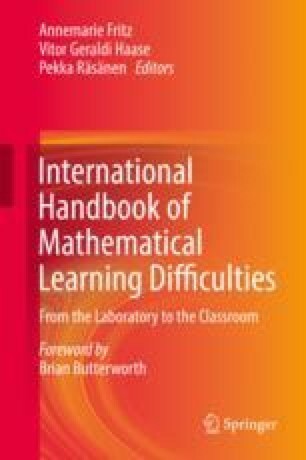 This chapter introduces the key issues of mathematical learning and the difficulties encountered in Taiwan. Focusing on the characteristics of Asian culture and how it impacts on children learning mathematics, we review the main issues of mathematical learning, including students’ academic achievement, learning difficulties, identification of mathematical learning difficulties (MLD), and placement in East Asia from a distinctly educational perspective. We begin the chapter by introducing the cultural background of Taiwan, which highly affects parents’ perception and how they raise children throughout their schooling. We then summarize the statistics on international comparative data on students’ academic performance and attitudes toward mathematics. National differences and possible mechanisms are highlighted and discussed accordingly. Next, we introduce the educational policies of diagnosis and placement of learning difficulties. Finally, we close this chapter by portraying the assessment tools and diagnostic criteria that are commonly used to identify MLD in Taiwan. Through the lens of highlighting cultural distinctiveness, we seek to provide insights into how the cognitive and behavioral mechanism of mathematical learning can be influenced by education and accordingly enhance mathematical learning in educational practice. The authors thank Dr. Yuchun Chen for her valuable feedback and Pei-Fang Lee for her assistance with the figures. Education Bureau, K. C. G. (2016). All cities and counties short-term tutorial center. Retrieved from http://bsb.edu.tw/ (in Chinese). Hung, L.-Y. (2014). Description of Learning Disabilities Students Diagnosis Regulations. Taipei, Taiwan: Ministry of Education. Retrieved from http://iweb.ntnu.edu.tw/spe/identify2014/file/09.pdf (in Chinese). Lee, J. R., & Hsieh, C.-E. (2016). Basic Arithmetic Skill Test – Revised. Retrieved from https://drive.google.com/file/d/0B0GaWSgkG5rYMFU1aTNoTXhzNzA/view (in Chinese). Ministry of Education (MOE). (2015b). Education Statistical Summary, No. 39. Taipei, Taiwan: Ministry of Education. Retrieved from http://stats.moe.gov.tw/files/brief/%E6%88%91%E5%9C%8B%E8%88%87%E4%B8%BB%E8%A6%81%E5%9C%8B%E5%AE%B6%E9%AB%98%E7%AD%89%E6%95%99%E8%82%B2%E7%B5%B1%E8%A8%88%E6%8C%87%E6%A8%99%E6%A6%82%E6%B3%81.pdf. (in Chinese). Ministry of Education (MOE). (2016). Annual statistics of special education. Retrieved from https://www.set.edu.tw/Stastic_WEB/sta2/frame_print.asp?filename=stuA_city_All_spckind_ABCE/stuA_city_All_spckind_ABCE_20161020.asp (in Chinese).